AL-HARD | ZIRCAR Refractory Composites, Inc.
ZRCI AL-HARD Rigidizer/Hardener is used to increase the hardness of ZRCI Refractory Sheet products. AL-HARD is comprised of Aluminum Oxide and Phosphoric Acid in a water base. Refractory Sheet products treated with AL-HARD are ready for use after drying. When a chemical bond forms it hardens the fibrous material. The degree of hardening depends on the amount of AL-HARD used. AL-HARD is non-flammable and is not affected by freezing. 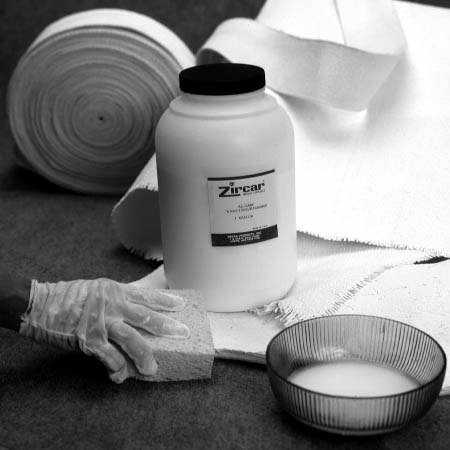 It can be applied by immersing, spraying, brushing or sponging on many of ZRCI’s Refractory Sheet products. MOR, psi @ Room Temp. ZIRCAR AL-HARD Rigidizer/Hardener can be applied to A Moldable at a rate of up to 1 gallon/ 24in. x 72 in. roll. It can be applied at a lesser rate depending on the degree of hardening desired. Before applying, dry RS-A Moldable at 100°C(212°F). Apply AL-HARD by immersing, spraying, brushing or sponging it on the surface of the dried product. Allow AL-HARD treated A Moldable to dry. The following is a summary of the affect of AL-HARD application at a rate of 5% solids pick-up (approximately 1 gallon/roll).